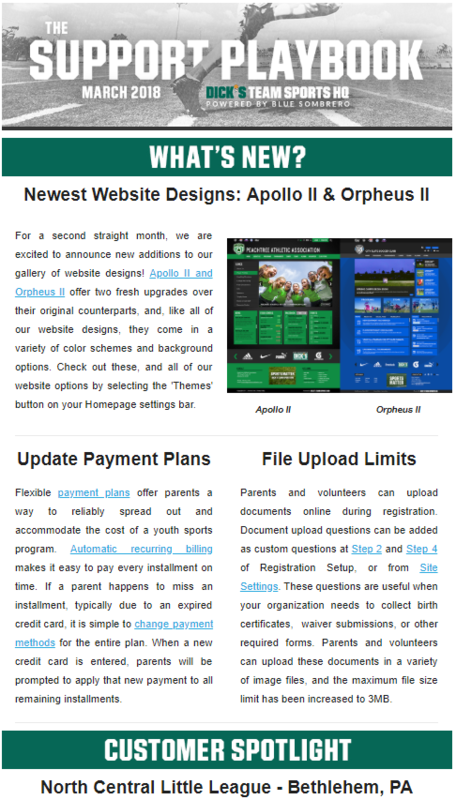 In the month of March, we launched two new website designs, Apollo II and Orpheus II. These offer a fresh, new appeal to two of our most popular designs. An update to Payment Plans was released that will save parents and admins a ton of time during the season. Another much-requested enhancement was an increase to the file size limit for files that users upload during registration, such as photos and birth certificates. Team Sports HQ is driven by our customer base, and we were proud to have one of our Little League partners, North Central Little League, provide us with a success story around their experience in our Customer Spotlight section. Finally, a refreshed on Participant and Volunteer Reports will help any admin stay on top of their enrollment numbers every season. And as mentioned, we always listen to our customers when it comes to our product road map. Send us any of your suggested enhancements in a format that will best help our development team. Admins aree notified of these product updates via an in-app message every time a release is pushed. If you ever want to look back at past messages, you can click the green icon in the bottom right corner of your Team Sports HQ website, once you are logged in.